A small monument of the 10 Commandments in Somersworth, New Hampshire, is sparking a big debate. Town leaders are restoring the monument that was toppled by vandals last month. Now, some are challenging the move, saying it's unconstitutional. "I do think it's government promoting of certain religions," said Somersworth City Councilor, Jennifer Soldati. 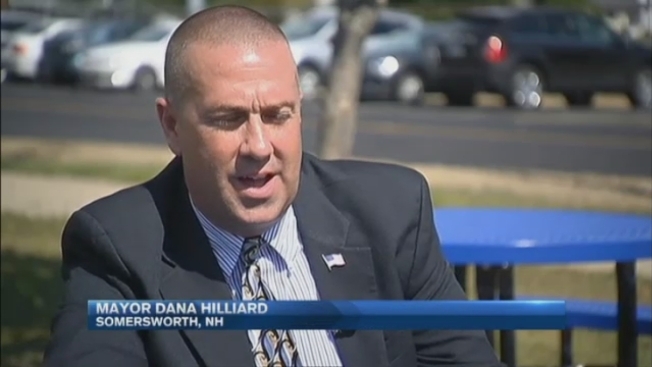 "I think of our children all the time and I think they're born agnostic and this is indoctrination," said Somersworth City Councilor, Jessica Paradis. The monument has been located on a traffic island since the 1950's and the town buildings and streets have been built up around it. Many residents, including Mayor Dana Hilliard, feel if it's not restored, they're losing a part of history. "We want to keep our history alive by keeping those things in place," said resident Dina Gagnon. The mayor said he supports the restoration, saying the monument isn't about religion, but rather the nation's history. It was donated to the city by the Fraternal Order of Eagles in 1958. "It's an important historical monument that represents that time period the height of the Cold War, the good and the bad that came out including McCarthyism," Hilliard said. But according to a website dedicated to fighting for religious freedoms, the Eagles monument is one of 190 donated to cities nationwide to promote Christianity. Soldati and Paradis were outnumbered in a 7-2 council vote last week. Within a couple months the monument will be put back in it's original spot, with two flags and a historical marker explaining it's significance. The ACLU tells necn they do believe the placement of the monument is unconstitutional but have not yet decided whether to take legal action. The Supreme Court has often, though not always, ruled that statues depicting the 10 Commandments be removed from statehouses, according to MSNBC.